Why does native language instruction make sense for English Language Learners? Isn't the more English exposure the better? It may seem counter-intuitive to some, but research has shown again and again that the fastest, most efficient method of learning academic English is through a strong education in the native language. It may seem counter-intuitive, but it is actually common sense. If you drop a student into a classroom where instruction is happening that she can't understand, she will fall behind academically. She may eventually learn the language, but she will have lost countless hours of subject matter instruction in the process and will not be on grade-level. If, however, we teach her content in her native language whie she is learning English, she will not be behind her peers academically when she is finally fluent in English. Why is a Dual Language program the right choice for my students/children? Although late-exit bilingual education programs, where students exit native language instruction after 4-5 years, show greater academic success than early-exit or ESL programs, Dual Language programs are THE ONLY bilingual education programs proven to close the achievement gap between English Language Learners and their peers. This is evidenced by results of long-term, standardized assessments. 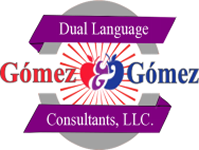 Why the Gomez and Gomez DLE Model? The G&G DLE model has been a proven effective academic and linguistic model for 20 years (since 1995). Through positive "word of mouth" alone, the G&G DLE model has grown from implementation in 2 schools in one district (PSJA) in 1995 to now more than 700 schools in 139 districts across 11 states (approximately 650 schools in Texas)! The G&G DLE model is the most widely implemented DLE model in the United States, and includes both One-Way and Two-Way Dual Language programs. ELL students participating in the Dual Language program are the highest academic performing students in about 85% of the districts implementing the G&G DLE model. The G&G DLE model is not just a model, but rather a complete system that includes support trainings for each of its major model components, thus districts are provided with ongoing support to achieve the strongest possible academic and linguistic success. The G&G DLE model incorporates 30 educational "Best Practices" that are also well grounded in educational research. The G&G DLE model requires a three-day intensive teacher training in order to effectively implement the model in the classroom. The G&G DLE model makes available to school districts regular Adminstrator trainings to assist in implementing the model with "fidelity". The G&G DLE model makes available to districts follow-up classroom visits where G&G DLE personnel conduct visit each and every classroom implementing DL to assess the "fidelity" with which they are implementing the model components. The G&G DLE model includes 1st year and 2nd year reading and writing benchmarks to ensure initial implementation is strong. The G&G DLE model has as its stated measure of success, equally strong students in English AND Spanish across the academic curriculum by 5th grade.